President Uhuru Kenyatta and ODM leader Raila Odinga (file photo). Politicians in the Orange Democratic Movement (ODM) have taken jabs at Deputy President William Ruto, accusing him of derailing President Uhuru Kenyatta's war on corruption. The politicians made several allegations against the DP on Saturday, citing matters including the phantom Arror and Kimwarer dam projects in Elgeyo Marakwet County and the suspension of the President's social media accounts over interference by some staff members. They want Dr Ruto to step aide to allow investigations into his conduct amid allegations of corruption. On Saturday, a top ranking member of Dr Ruto's inner circle, who is part of the parliamentary leadership, told the Nation that on Friday night, he summoned a clique of trusted allies to his Karen home in Nairobi. The agenda, the source said, was to review Mr Kenyatta's comments during a visit to Namibia that he will not spare even his closest political allies in the war on graft -- a quote seen to target the DP. Dr Ruto has said repeatedly that he has never engaged in graft and that he supports the fight. But he has also made it clear that the ongoing war on grand corruption and brazen theft of public resources is targeting him and his 2022 presidential ambitions. 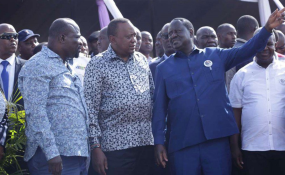 The ODM leaders, however, accused him of using proxies to hamper the government's efforts against a vice that has crippled the country and subjected Kenyans to a myriad of challenges. Siaya Senator James Orengo urged the President to firmly tackle corruption and all those found culpable. "I applaud the President for the courage he has as the head of state and his assurance that no one will be spared," he said on Saturday. One of the ODM politicians who made allegations against the DP was Secretary-General Edwin Sifuna. Mr Sifuna accused Dr Ruto of attempting to censor President Kenyatta as he tightens the noose on those accused of stealing public funds. "It is shocking that some people have even infiltrated the social media accounts of the President and brought it down due to his commitment to fight graft," he said while campaigning for the party's candidate in the Ugenya by-election scheduled for April 5. But Chief Of Staff Nzioka Waita explained that the President's Twitter and Facebook accounts had been deactivated for investigations. "All official social media handles for the President have been temporarily suspended to allow for the necessary remedial measures to be undertaken," he said. Oburu Oginga, an East African Legislative Assembly member of parliament, accused Dr Ruto of being involved in mega scams that have crippled Kenya's economy. Mr Oginga also accused the DP of presiding over corruption cases by appointing people to strategic positions, people whom he said have been involved in underhand deals. "Ruto should sympathise with the ordinary Kenyans and stop handling public resources with reckless abandon. "It is unfortunate of him to belittle the money involved by reiterating that only Sh7 billion could have been lost when over one million Kenyans are facing death due to starvation," he said at a political rally at Awendo Township in Ukwala, Siaya County. He pointed out that the war on graft is targeting neither individuals nor communities but people who steal public funds. It has been said that Sh21 billion was lost in the dam projects deal but the DP has denied this, saying "it is impossible" that the government lost that much and that the correct figure was Sh7 billion. However, Treasury Cabinet Secretary Henry Rotich said that up to Sh19.8 billion was paid to different firms in the two projects on various dates as at the end of 2018. The amount is Sh1.2 billion short of the Sh21 billion the Directorate of Criminal Investigations (DCI) is pursuing. Homa Bay Senator Moses Kajwang' said there was sufficient evidence to prosecute individuals involved in the dam scandals and others. "We are now calling on President Kenyatta to take action against any public servant who has been involved in any kind of corruption, knowing that Kenyans are behind him," he said. He appealed to the DCI to start presenting files to the Director of Public Prosecution so the suspects are taken to court. Migori Senator Ochillo Ayacko said it was suspicious of Dr Ruto to criticise investigative agencies. The DP has accused the DCI of being used to undermine mega Jubilee Party projects in the guise of fighting corruption but critics have told him this is counter-productive. National Assembly minority leader John Mbadi assured DCI boss George Kinoti of unequivocal support from ODM legislators and Kenyans at large. "The DCI is within his mandate to investigate all criminal activities and economic crimes. Mr Kinoti should not be intimidated," said Mr Mbadi. Citing the National Cereals and Produce Board, Kenya Pipeline, Kenya Airports Authority land and the dam scandals, the Suba South MP said the Deputy President's allies have been linked to scandals. "One is either a thief or benefitting from the proceeds of theft when he is constantly defending thieves," he said. Mr Chris Karan, who is seeking to retain the Ugenya parliamentary seat, alleged that his opponent David Ochieng was being used to undermine the ODM leader. "If you see a tortoise on a table, you should ask yourself who placed it there. It is not a secret that Mr Ochieng is being pushed by our opponents," he said. He did not elaborate. Nyatike MP Tom Odege said a vote for Mr Karan would give Mr Odinga a bargaining chip and help reinforce his 'handshake' with President Kenyatta. "We should not vote for a family party which we cannot hold to account," he said in reference to the Movement for Democracy and Growth (MDG), whose leader, Mr Ochieng, successfully challenged Mr Karan's victory. Just like the High Court and the Court of Appeal, the Supreme Court in December 2018 upheld the decision to nullify Mr Karan's election, citing electoral malpractices. Politicians Agnes Zani, Fred Outa, Caleb Amisi, Lilian Gogo, Gideon Ochanda, Mark Nyamita, Elisha Odhiambo, James Nyikal and Christine Ombaka also addressed the crowd during the campaigns for the ODM candidate.